When peaches and nectarines are in season, make this simply elegant dessert. In a medium mixing bowl stir together flour, the 1/3 cup nuts, and granulated sugar. Cut butter into flour mixture until pieces are the size of small peas. Gradually stir water, 1 tablespoon at a time, into flour mixture, tossing with a fork until dry ingredients are moistened. Form dough into a ball. If necessary, cover dough with plastic wrap and chill in the refrigerator for 30 to 60 minutes or until dough is easy to handle. On a lightly floured surface, flatten pastry dough slightly. Roll dough from center to edges, forming an 11- to 12-inch circle. To transfer pastry, wrap it around the rolling pin. Then unroll the pastry onto a 9-1/2- to 10-inch tart pan with a removable bottom. Ease the pastry into the tart pan, being careful not to stretch it. Fold edges in and press the pastry against the fluted sides of the tart pan. Line pastry shell with a double thickness of foil. Bake in a 375 degree F oven for 10 minutes. Remove foil. Bake for 8 to 10 minutes more or until golden. Completely cool pastry shell in pan on a wire rack. For the filling, in a medium mixing bowl beat together cream cheese and the powdered sugar with an electric mixer on medium speed until fluffy. Stir in 1 tablespoon of the whipping cream. In a small, chilled mixing bowl beat remaining whipping cream until soft peaks form; fold into cheese mixture. Spread filling into the cooled tart shell. 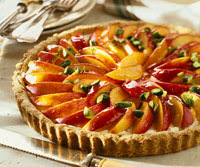 Arrange the nectarine or the peach slices in a circular pattern, overlapping slices slightly, on top of the filling. In a small saucepan combine peach or apricot preserves and honey; heat and stir just until melted. Press through sieve, discarding solids. Carefully brush or spoon the glaze over the nectarine or peach slices. Sprinkle with the 2 tablespoons chopped pistachio nuts. Chill up to 1 hour. Gently remove side of the tart pan; carefully transfer the tart to a serving platter. Makes 8 to 10 servings. Calories 335, Total Fat 20 g, Saturated Fat 11 g, Cholesterol 50 mg, Sodium 126 mg, Carbohydrate 36 g, Fiber 2 g, Protein 5 g. Daily Values: Vitamin A 20%, Vitamin C 4%, Calcium 3%, Iron 10%. This entry was posted on 2:08 AM and is filed under Desserts . You can follow any responses to this entry through the RSS 2.0 feed. You can leave a response, or trackback from your own site.